Every step of the sales cycle presents an opportunity for marketers to cultivate, nurture and mature the relationship with an important prospect. Are you up for the task? We exist in the age of the enlightened buyer, who has more control than ever before on how and when they consume information about products and services. Today, it is incumbent to meet buyers on their terms. However, research by the International Data Group shows that 86 percent of B2B buyers say the content created by marketing departments is not useful, relevant or aligned with their needs. How can today’s marketer ensure that prospects are being adequately nurtured at every turn on the customer journey? Join us on Wednesday, March 18th at 11:30am for Sales Cycle Content Marketing: Engaging the Prospect at Each Point in the Journey. 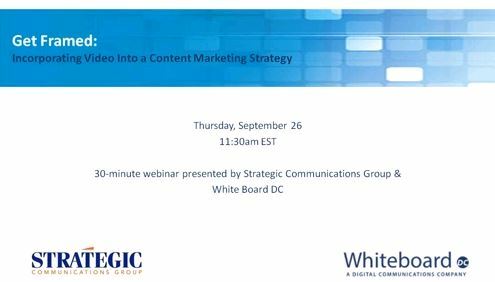 Hosted by Strategic Communications Group (Strategic) founder and CEO, Marc Hausman, and featuring Jessica DeCianno, senior director of marketing at Crowdstrike, you will gain insight into industry best practices for full sales cycle content marketing. There is a cliché in marketing that “sales is where good leads go to die”. Does it have to be that way though? It’s no secret that modern marketers often struggle to understand the needs and priorities of sales teams. Inevitably, this disconnect creates frustration and dissatisfaction across the organization. But the bottom line is that, according to Marketo, when sales and marketing teams are in sync, companies are 67 percent better at closing deals. The foundation of collaboration is open, honest and frequent communication. That shouldn’t be so hard to achieve, right? At Strategic Communications Group (Strategic), we are here to help you gain more insight into the thought process and requirements of top-level sales executives. Join us for Confessions of a Sales Leader: What I Expect From Today’s Modern Marketer, where Kurt Gastrock, Senior Vice President of Enterprise Sales at Neustar (NYSE: NSR), will offer exclusive insight into what today’s sales leaders expect from their marketing organization. This 30-minute online event is set to take place on Wednesday, February 25th at 11:00 am and will be hosted by Strategic founder and CEO, Marc Hausman. It is no secret that the performance of a marketing campaign eventually comes down to a sales reps’ ability to have a conversation with a prospective buyer. That’s why B2B organizations invest time and money to train and coach their sales executives on the science of prospecting and lead qualification to convert more leads into sales opportunities and closed deals. According to a recent study by MarketingSherpa, 57 percent of companies identify ‘converting qualified leads into paying customers’ as a top priority. As organizations increase investments in content creation, social media, search and digital communications for lead generation and nurturing, marketers have sought new approaches to motivate sales teams to take action in a timely manner. Most organizations have implemented technologies to help them connect with new and existing prospects and, ultimately, to enable the sales teams to close deals. One of the most popular tools that marketers rely on is a CRM platform, such as Salesforce.com. A recent poll of 800 respondents by Corporate Visions showed that 87 percent of marketers are required to use a CRM platform by their companies. Yet, 79 percent said that they simply “check the boxes” when it comes to using their system. That’s where the Strategic Lead Management CRM solution comes in. The solution, developed by Strategic Communications Group in partnership with Rainmaker Associates, can help you leverage the functionality of Salesforce.com to develop a custom and comprehensive lead flow process, combined with a dashboard for tracking and reporting. Join us on Tuesday, September 30 at 3:00pm for Web2Sales: How Marketers Can Inspire Sales Team Action and Accountability. Hosted by Strategic founder and CEO, Marc Hausman, and featuring John Sisson, Managing Partner at Rainmaker Associates, you will learn more about the features and functionality of the Strategic Lead Management CRM solution. Oversaturation and content shock are issues that today’s marketer must overcome to find success. With so much information already on the Web, and a projected increase of 600 percent by the year 2020, what can today’s corporate blogger do to stand out from the crowd? View this exclusive Q&A with Strategic Communications Group (Strategic) director, Ryan Schradin, to explore how marketers can apply editorial style to their corporate blogs in order to create a unique user experience. During his time at Strategic Ryan has worked with such clients as Iron Bow Technologies, Juniper Networks, K12, Pitney Bowes, and Polycom to implement successful content marketing and sales enablement campaigns. • Editorial methodology for constructing articles, videos, and podcasts. Can content marketing, social media participation and digital communications truly be aligned with tactical sales activities? You bet! In this informative 30 minute Webinar hosted by marketing automation provider eTrigue, Strategic Communications Group’s (Strategic) Marc Hausman shares five best practices that can help your company drive more leads, nurture prospect relationships and close a higher percentage of deals. Marketers realize that in order to grow revenue, they have the primary responsibility for bringing in more qualified leads. Deploying marketing automation to accomplish a significant part of lead nurturing and scoring is increasingly common, as is integrating CRM systems with marketing automation systems. email systems it replaces. So why is there any reluctance? 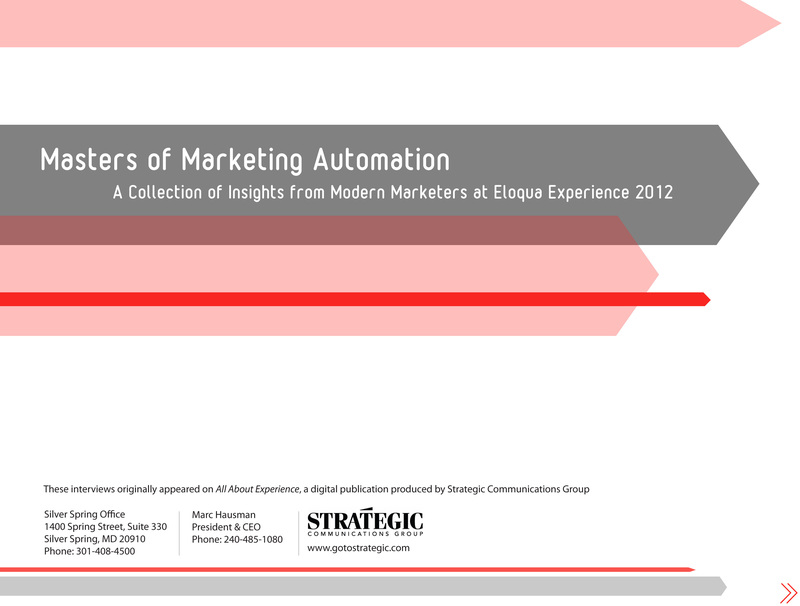 This free whitepaper from eTrigue offers six steps for using marketing automation to identify qualified prospects. Today’s marketers recognize that traditional marketing, advertising and public relations techniques are becoming less and less effective. Enter content marketing. It’s a term all marketers have heard and likely thrown around, but a concept that not all have mastered or even begun to explore. 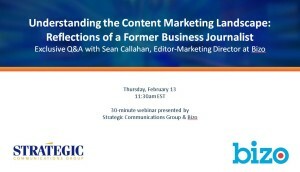 Join us for an exclusive Q&A with Sean Callahan, Editor-Marketing Director at Bizo, in a free 30-minute webinar exploring the current landscape of content marketing and how to successfully navigate it. Successful marketers know that creating and maintaining brand awareness is an important key to marketing success; you can’t drive sales if your prospects have never heard of you. However, establishing awareness is easier said than done these days. 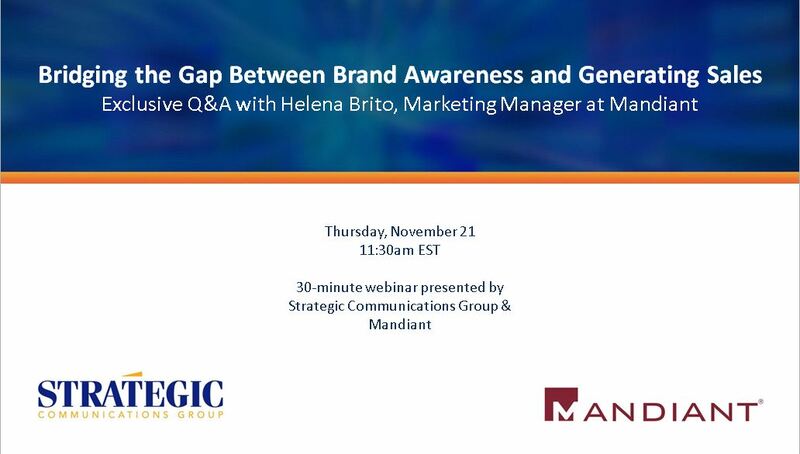 Join us for an exclusive Q&A with Marketing Manager at Mandiant, Helena Brito in a free 30-minute webinar exploring ways to leverage social media to bridge the gap between brand awareness and generating sales. Marketing content is everywhere we look. Different pieces of content serve varying purposes (such as thought leadership, lead generation, etc. ), but the overall outcomes — to help your customers solve problems and increase revenue — should always remain.So, where to start? Join Patrick Cahill of beep! Directed Voicemail and Meredith Lawrence of Polycom, Inc. for a free 30-minute webinar exploring best practices for aligning content with tactical sales activities. Marketing experts and thought leaders are continually searching for ways to reach their target audiences effectively, and with the variety of social platforms and mobile devices available to prospects and customers, it is crucial to create a dynamic portfolio of content. So, what’s the secret? Join John Carter of Capitol City Entertainment (CCE) and Shany Seawright of Strategic Communications Group (Strategic) for a free 30-minute webinar exploring the importance of video creation as part of a content marketing strategy. Marketing isn’t what it used to be. It has forever changed with the consumerization of the workforce and the increasing influence of the digital sphere. These two influences alone mean that marketing has to rethink its processes and how it engages with sales to be successful. Tried and true marketing approaches will not succeed in a market moving at all new speeds. So, what’s a marketer to do? 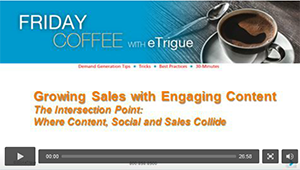 Join Marge Murphy, of Acadia Lead Management Services and Nicole Gillen, of 3Pillar Global, for a free replay of a 30-minute webinar exploring the importance of interactions and collaborations between your sales and marketing teams, which play a large role in the success of marketing initiatives for your sales enablement goals. Today’s enlightened buyer has more control than ever before on when and how they consume information. This has caused many companies to reinvent their sales and marketing programs to maintain growth. Today, it’s incumbent to meet buyers where, and how, they want. View this 30-minute webcast hosted by Strategic Communications Group and eTrigue, featuring Michael Riemer, VP Products and Channel Marketing at Decisiv, to get an insider’s view about Decisiv’s goals, expectations and experiences in creating DecisivConnect, a new program designed to accommodate the new buying process. Corporate marketers face an empowered and informed business buyer. In today’s technology-saturated environment, customers are further along the purchase process than they’ve ever been— without ever having been in contact with a vendor. As a result, marketers must embrace new technologies and tactics to reach potential leads. We compiled this abridged e-book of exclusive interviews with a few of today’s masters of modern marketing who utilize Eloqua within their own organizations. The following interviews with corporate marketers highlight and share best practices, along with insights on how Eloqua is helping them reach their targets and move prospects along the sales pipeline.